Discover 3 simple rules for choosing the right business tools for greater productivity and better profit. Rule number 1: Do we need it? If we don’t absolutely need it, I don’t want to pay another subscription for a tool. I can tell you my tool subscriptions, when you combine Slack, Dropbox Google Apps… it adds up. I mean, it’s thousands and thousands. Some of these cost $4,000 a year, or $7,000 a year. I don’t want any more tools than we need. 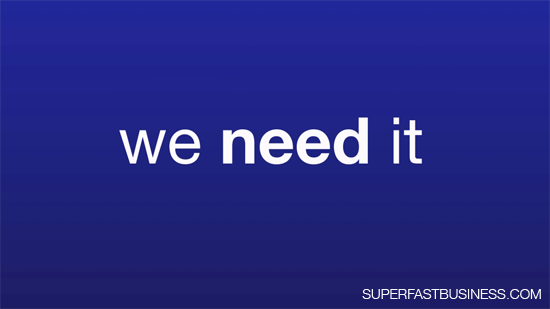 But if we need it, then we need it. And I’m not going to skimp if we need it. Next thing: Is it the best? This is where we compare our options. Should we use Basecamp, or Teamwork, or Trello, or Podio, or Google Apps? We compare, we put an analysis in, we trial them, we check them out, we see which one’s the best and we choose the one we want to use. Should we use Slack or Skype? Should we use Dropbox or Drive? These questions come up, and we review it every 12 weeks. For some systems, I mean I don’t want to shop and change tools, it’s a huge cost to the business to change tools, not just financially, but in labor, and confusion, and stress. So some tools like Nanacast, I’ve been using for a long time. I’ve processed over $7 million through Nanacast, I’m not about to change it without a very good reason., because it’s the backbone of my business. I have changed to Google Apps, it was a pretty painless one. We changed across to Slack, and I could see us staying there. It’d be pretty hard for us to move away from it, it’s that good. And we’ve got everything in Dropbox. I’m talking about hundreds of gigabytes. I do not want to have to move that to Drive, it’s just not even an option. So think carefully when you’re selecting a tool for the long haul. And then do we know how to use it? You know, there’s a lot of tools that do great things, and sometimes we don’t even know how to use it, so we’re not getting the best results from it. That’s where I suggest you have someone do training in your business. Get them trained up on the tools so that you’re actually getting the absolute best value you can from the tool and that the investment is well spent. So today’s action is remove one tool from your business. That is like go into your iPhone or your iPad and uninstall an app. Or review your subscriptions for everything you’re currently subscribing to, whether it’s a keyword discovery tool, an SEO tool, an invoicing tool. For example, right now, I can think, I’ve got FreshBooks. I probably don’t need it anymore, I’ve got no more retail recurring high-end customers, so it’s a tool that I just don’t see myself needing now that I could probably set up an invoice in Xero just as easily, so I’m going to take an action step on this session as well. So think about, in your business, what are you paying for that you don’t need? It’s either not the best tool, you don’t actually need it, or you’re paying for something you don’t know how to use. So go and delete something, and then you’ve probably saved yourself the cost of this month’s membership, and next month’s, and the month after, just from one subscription tool. Talk about it: What are some business tools you absolutely cannot do without?